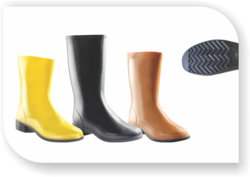 Exporter of a wide range of products which include ladies long polyvinyl chloride gumboots. We are providing our customers with a wide range of Ladies Long Polyvinyl Chloride Gumboots.The product is highly comfortable and is manufactured using high quality raw material sourced form the reliable vendors of the industry. These boots are available in varied sizes as per the requirements of the customers. They are tested on varied parameters before delivery to the customers.